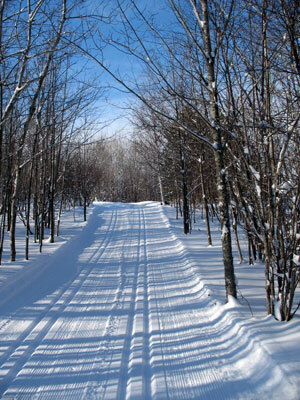 Getting there: The Chassell Classic Ski Trail is located in Chassell, MI. Go up 2nd Street, right across from the Chippewa Motel and the trailhead is at the Old Chassell School which is now the home to the Chassell Heritage Center. What's there: Marketing blurb: On trails groomed for the traditional skier, the whole family can enjoy the pleasures of skiing the Chassell Classic trails system. The hills have been designed to provide ample landing space at the bottom with no surprise corners. A one kilometer lighted trail adds hours of skiing time to the short winter days. Tremendous cooperation from private landholders and The Chassell Recreation Club have made this trail possible. This trail is maintained by volunteers. Trails are groomed Wednesday, Friday and weekends as necessary. When it is snowing heavily, trails are groomed five days a week.